If you haven’t guessed it yet, I’m a sucker for monograms. I assert, here and now, for the world to know, that I love monograms! My friend is not a monogram enthusiast. I just don’t get it, she said. Why would you want everything in your house encrusted with your initials? Initials on the walls, on upholstery, on bed sheets, on towels. Initials on your cell phone case, your purse, your clothes! Initials on your shoes, your slippers, your coat. Initials on your notebooks, your pencils and pens, your jewelry. No thank you! she concluded. I just don’t like monograms. Ok, I admitted. If everywhere I looked – in my house, in my closet, in my car, on my person – were “encrusted” with my initials, I’d probably dislike monograms, too! Well, that’s what monogram enthusiasts do, she insisted. Not so! Not so! cried I! I adore monograms, but where do you actually see them in my house, in my wardrobe, on my person? Snort-chuckle, she responded (because that’s the way she laughs…) Then you’re not really a monogram enthusiast. You don’t really love monograms – you just like the artistry involved in monograms. But you don’t really love monograms. People who love monograms, use monograms. Well, patooey on you for your logic, thought I. But I said: You’re right. I hate monograms. Let’s eat. There’s no point in arguing with someone who doesn’t love monograms, about loving monograms. In a sense, she’s right: I love the artistry involved, whether it’s the embroidered monogram, the painted monogram, the engraved monogram, the paper-quilled monogram. I love letters in general. I melt when I see beautifully embroidered monograms on linens. Melt, I tell you. And I love the idea behind monograms – the love and care that goes into personalizing important or best-treasured things. Or even just the utilitarian marking of things, done in an attractive way. But, admittedly, I only have a few monogrammed items – a little needle case, this gorgeous piece of linen, a linen towel with someone else’s initials on it. I don’t have monograms screaming off the walls in my house, jumping off the sofa into people’s faces, or bellowing from my closet. That doesn’t mean I don’t love monograms. You don’t have to have monograms everywhere, to be a monogram enthusiast. You don’t even have to use monograms, to love monograms. And you don’t have to love every instance of monogramming. If you appreciate monograms for what they are, when they’re worth appreciating, I think you can safely say you at least like monograms. It doesn’t have to be an either-or proposition. That’s my position, and I’m sticking by it. And now I’m off – today, I’m going to monogram the floor of the kitchen, the hood of my car, every ceiling fan in the house, and the outside walls on the chicken coop. Heck, I might even monogram the chickens. Here are the printable pages for the M and N. If you choose “no scaling” (or a similar setting) on your printer, the letters should print at 2″, 3″, and 4″ high. You can enlarge and reduce them to suit your needs! I’m that way with goldwork, most embroidery truthfully. It’s beautiful, elegant and shiny but just not something I need a lot of in my house. It’s nice to have friends and relatives who are happy to receive such things. The M and N Daisy and Ring monograms are really pretty especially the N. Like you I do like to see embroidered monograms their individual stitching and designs are always interesting and inspiring and the various styles can be used for other embroidered projects. Also it’s a nice personalised gift for that special person for that special occasion. Thanks for creating and sharing the Daisy and Ring monogram series. There is a much respected garden near me which is covered in the monograms of the owner and his late wife. They are in plaques over the door, on statues, even picked out in clipped box and bedding. It amuses me but then I know the owner who is eccentric and I would expect nothing less but I have seen visitors who are really put off by it. The owner, a man prone to ostentation, says that he loves old italian gardens and they had such things so why not. So it makes me wonder if in this modern time we are less keen on this time of thing whilst our ancestors liked to label everything as their own! I think monograms are a geographically and demographically variable thing! I don’t recollect ever seeing a monogram in someone’s house back in the UK, where I’m from, but here in the US I see them quite frequently amongst my Midwestern in-laws and their friends. I doubt very much that I’d see them in the homes of my friends on the coasts, though! Like everything, they’re a fashion that is more in vogue in some places than others, and amongst some demographics than others. Personally, I can appreciate the artistry of a well designed and executed monogram without actually wanting one on my wall! My family has a “extremely” hard time with my needlework…comments abound like “grotesque, I have to keep looking at it”..(remember cabbage patch dolls)”, gaudy, and makes me nauseous…these are particular ones I remember… I have had so many more “wonderful comments” from peers who understand…I have a wonderful appreciation for all things needlework…will I ever do anymore “cross stitch” hopefully never…I lost my enthusiasm for that form of embroidery many years ago but I look at the pieces I did fondly. I must admit all the “Monograms” you have shared over the years have been wonderful and someday I just “may” use them to embroider a wonderful piece of linen for what purpose ….well that will be in the future…but I know I willl love it them! I don’t think what your friend is describing is a love of monograms, I think its a manifestation of megalomania and narcissism! At the very least that would be a fetish. I’m with you, Mrs. Corbet! I love the idea behind monograms! I would love some monogrammed stationary (for when I write thank you notes, and hand-written letters) I adore the idea of monogrammed cutlery, and a set of silver brushes and combs with my initials on it. Heck, if I could get my hands on a real ‘dip’ fountain pen you bet I’d want it monogrammed! That said, in real life… I bought 3 (machine) embroidered hand-towels for my bathroom, and eventually I’ll monogram some napkins to match a tea set I have, but I can’t see myself going nuts over linens and such, unless by some miracle someone wanted to marry me! Just getting rid of a constantly misspelled last name would be reason enough for me to do it! But if you DO figure out a way to monogram the chickens let me know! My mom and I would love that! You can get real dip pens at an art store or an “arts & crafts” store in the area with the paints. As for an old fountain pen, I have some, but the bladders are all dried up and won’t work. Modern fountain pens use cartridges, unless you are willing to pay over $100 for a pen. You can use your own ink (from a bottle) even with cheap modern fountain pens (ones w/out a converter insert, a lever-pump filler or a drop filler). Take one of your used cartridges and simply refill it with whatever ink you like (this can be done with a syringe). If you’re changing colors (from what was last in the cartridge, be sure to rinse it out first). My mom stitched monograms on our “every day” napkins. Her mom had her initials stitched on bathroom and kitchen towels. So, in the old country where I was bornand surrounding regions (Croatia, Italy), it is a tradition. Most often they where white thread on white linen. I like them because they are personal and traditional, and our monogrammed napkins get used to wipe tomato sauce from the face. So much for ostentation! Perhaps your friend has other friends with embroidery machines. Those folks buy ALL the theme designs, and put them on everything that holds still long enough. I know someone who put Disney characters all over her shirts, made a purse, a checkbook cover and a tote – all matching and encrusted with machine embroidered Disney characters. We won’t talk about the kids’ clothes. Definitely OCD. I can’t imagine having enough time to hand-embroider monograms on everything. It takes time to design something that is appropriate to it’s use, material and user and more again to execute. It would need to go on special items ‘saved for good’ as my grandmother would say. Could you use a stencil and food coloring on the chickens? Haha! I’m seeing chickens running around with little monogrammed sweaters. 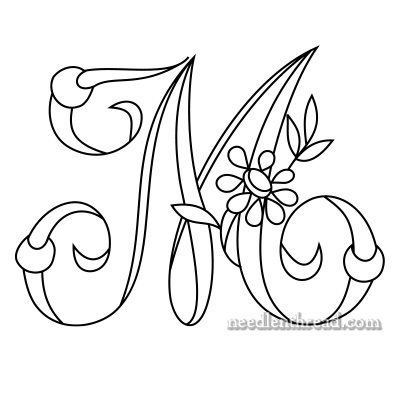 I love monograms, too, but just because they are beautiful! Not because they are MY particular initials. 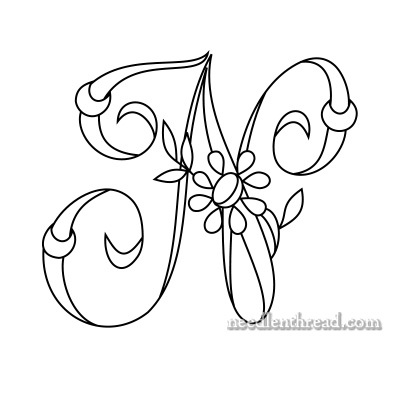 Also, if I have to pick something to embroider, sometimes a monogram is an easy choice. There are so many beautiful alphabets!! In my research I remember reading that monograms on linens and clothing were a purely practical way to identify a household’s items (as they were “sent out” for laundering). Soon (as is usual) the aristocracy separated themselves from the commoners by having elaborate monograms because they could afford it. I really don’t have any feeling towards monograms, pro nor con. I do love alphabets and the artistry of the forming of the letters. I never get tired of stitching alphabet samplers, many are reproduction samplers and the style of the letters vary. 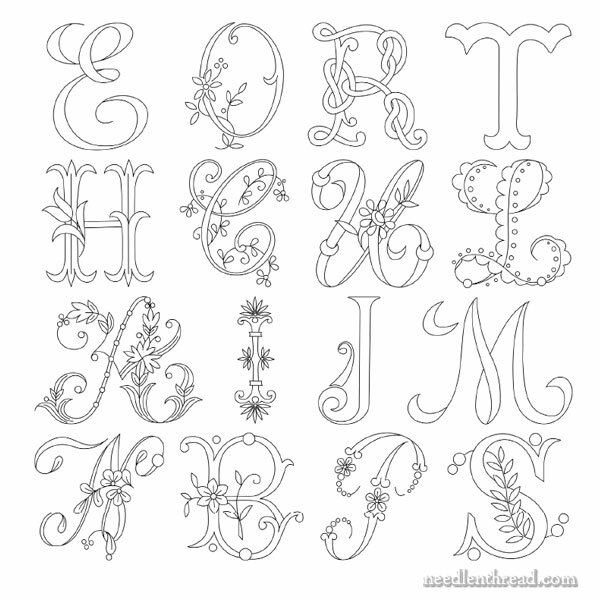 I do very little surface embroidery but this is a beautiful alphabet and I can imagine printing it on fine quality card stock and painting the letters, daisys, and rings. Love them, yes. But even more I love your sense of humor! We can really love things and not have them absolutely everywhere. You have a strong appreciation for the artistry of them. Their unique beauty. Monogrammed chickens…now THAT would be a sight to see! I like monograms. I even have a set, just one set, of towels that are monogrammed. We got them as a wedding present 9 years ago. They finally started being used this summer. I was saving them for “someday when I have a fancy bathroom” and I finally really thought about it and said “I love fancy bathrooms, but I would never be able to keep it fancy” so…the towels are being used! I, too, love monograms. I don’t have any on anything, but I have a collection of several iron-on monograms from years ago (some from my mother and grandmother, some from yard sales). I have several books on monograms. My mother enjoyed making samplers, and I have made a few also. Do you think if I monogram my car, it would keep my daughter’s cats from using it as a playground? No. NOTHING will keep cats from running muddy footprints all over your car . . . except never, ever washing it. And maybe not even that. I love cats, but I know them well . . . .
One of the things I like to do is to paint my own cards – greeting cards I mean. I make special ones for special occasions in the style of illuminated manuscripts although I have to confess I cheat a little by using metallic paint in place of real gilding. I used to do that quite a lot but then I got into embroidery and now I tend to embroider the initials for similar occasions. So you can see I too love letters and the artistry that surrounds their use in both paper and textiles. You can love something without going overboard. So “phooey” to your friend’s logic from me too. With a smile of course. I love your weekly postings. Not only do they inform and enlighten. They refresh; and most of all, they make me laugh. Such a precious thing. Previous Previous post: Secret Garden: Embroidering Feathers! Next Next post: Secret Garden: The Wing is Finished (ish)!